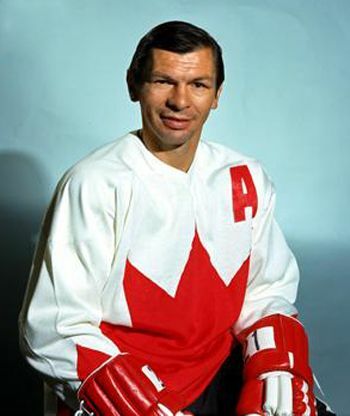 Garnet "Ace" Bailey first played for the Edmonton Oil Kings in junior hockey from 1964 to 1967, including a Memorial Cup championship in 1966. 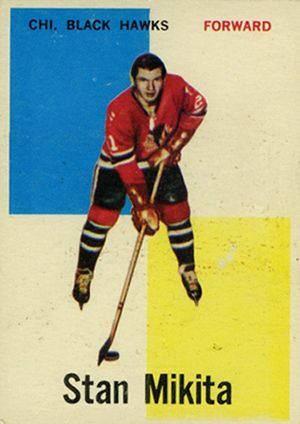 He was drafted by the Boston Bruins in the 1966 NHL Amateur draft with the 13th overall pick and started his professional career with the Oklahoma City Blazers of the Central Hockey League followed by further seasoning with the Bruins minor league Hershey Bears in the American Hockey League in the 1968-69 season where he had a nice season with 56 points in 60 games. 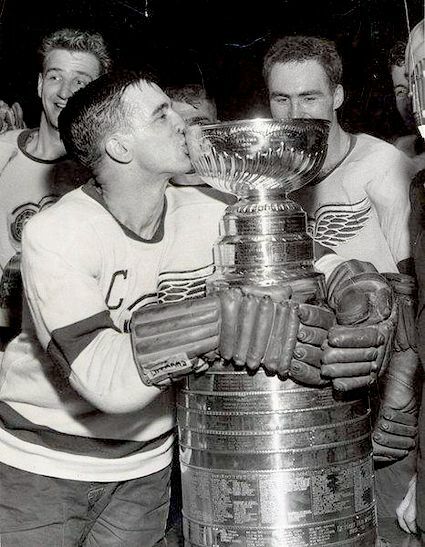 Bailey excelled in the playoffs with 14 points in 9 games as Hersey won the Calder Cup as AHL champions. He also found the time to make his NHL debut with the Bruins, seeing action in eight games during which he scored his first NHL goal on his way to six points. He even got his first taste of NHL playoff action in one postseason game for Boston. 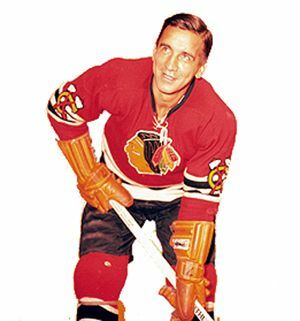 The 1969-70 season saw him crack the Bruins lineup, appearing in 58 regular season games. 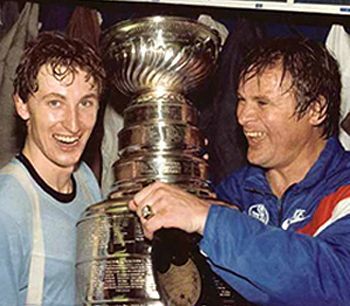 While Bailey did not suit up for any of the Bruins playoff games, that season (perhaps due to injury) his name was included among those engraved on the Stanley Cup following the Bruins championship, capped off by Bobby Orr's famous cup winning overtime goal in Game 4. 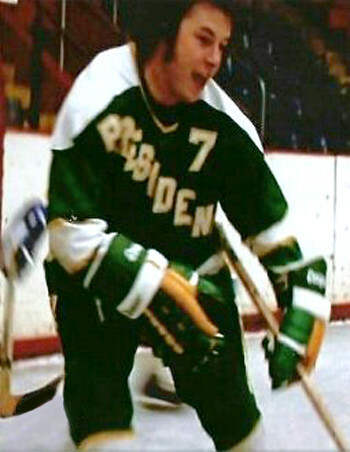 His next season was split between the Boston and Oklahoma City before finally establishing himself as a full-time NHL regular in 1971-72 when he skated in 73 games for the Bruins as well as 13 playoff games, including scoring the game winning goal in Game 1 of the 1972 Stanley Cup Finals versus the New York Rangers, as Bailey got his name on the Stanley Cup for the second time. Bailey's next three seasons in the NHL were ones of change, as the Bruins traded him to the Red Wings after 57 games of the 1972-73 season. 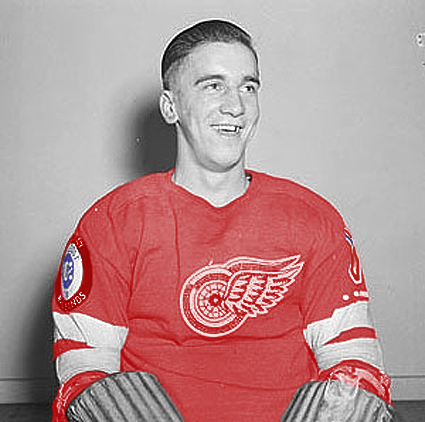 Half way through the next season, Detroit sent Bailey to the St. Louis Blues. 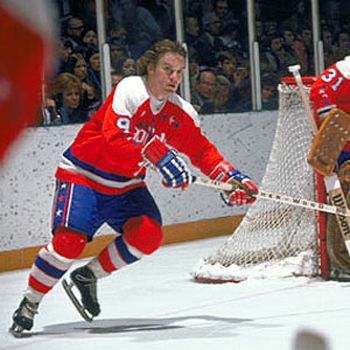 Once more Bailey was on the trading block, when St. Louis dealt him to the Washington Capitals after 49 games of the 1974-75 season despite Bailey having already set a career high with 41 points in 49 games for the Blues. Combined with the 17 points he scored in 22 game for the Capitals, his 58 points would remain the best offensive output of his 10 years in the NHL. 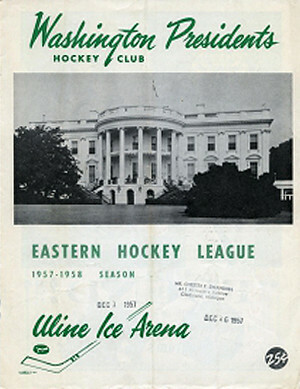 Washington proved to be a good fit of Bailey, and he would see action in 67 games in 1975-76 and 78 the following year, his second highest scoring season with 46 points. 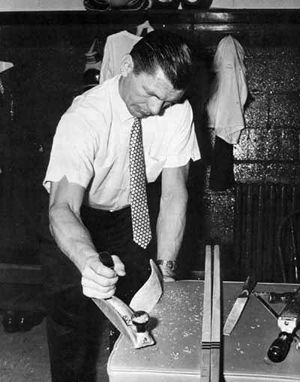 Bailey, who was known for his sense of humor once received a four-inch-manual from Capitals head coach Tom McVie, telling him how to get into condition. Bailey used the manual to prop up a beer keg in his bar. 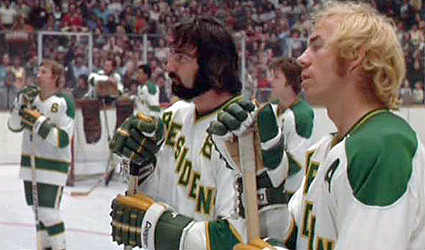 On the first day of training camp, according to theSan Francisco Chronicle, Bailey beat several other players in a footrace, and McVie said approvingly, "Ace, I can see you used your book this summer." 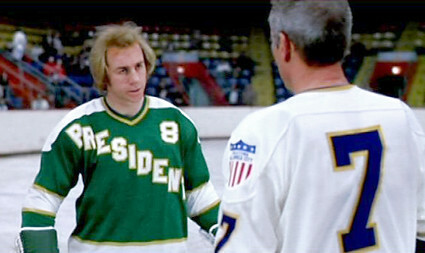 Bailey replied, "Coach, I used it every day." Another story relates how McVie once scheduled a practice for the squad at the ungodly hour of 4 AM. As the sleepy players arrived in their hotel lobby, Bailey, impersonating McVie, had already called and cancelled the bus scheduled to take them to the rink, which eventually led to the cancellation of the practice and some much needed additional sleep for the team. 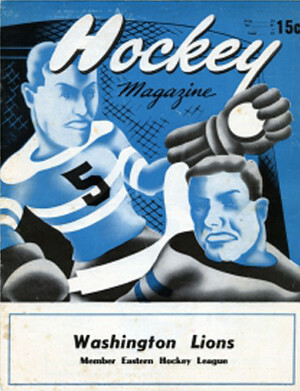 After one more season in Washington, his fourth, Bailey's career would come full circle, as he would return to the scene of his junior hockey roots in Edmonton, this time with the Oilers of the WHA for 38 games where he would become a roommate and mentor a young Wayne Gretzky, becoming one of the few players to play with both Orr and Gretzky. 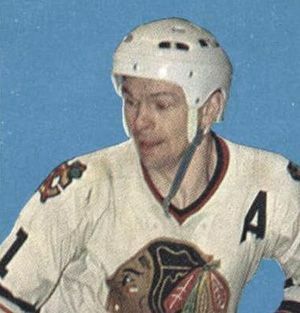 His playing days concluded with seven games with the CHL's Houston Apollos in 1979-80, before retiring to become their head coach, and a single game with the Wichita Wind of the CHL (while he was their head coach) in 1980-81. 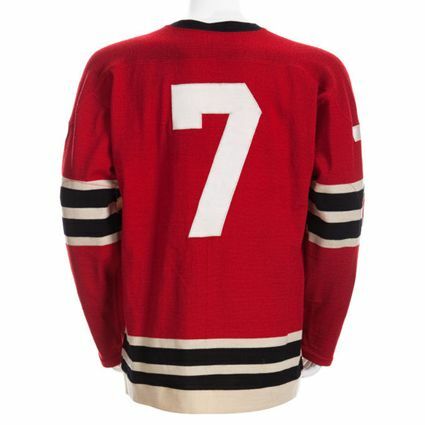 His final NHL totals were 568 games played, 107 goals and 171 assists for 278 points. 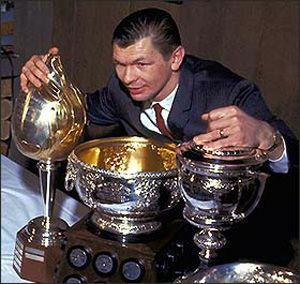 Beginning in 1981, he worked as a scout for the Oilers from 1981 to 1994 and win five Stanley Cup rings during the Oilers dynasty from 1984 to 1990, which included his name engraved on the cup three of those times. Sadly, while working as the director of pro scouting for the Los Angeles Kings, Bailey was a passenger on United Airlines Flight 175 which was crashed into the World Trade Center on September 11, 2001, killing all on board. 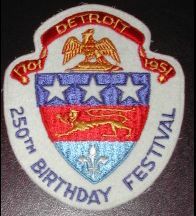 The Ace Bailey Children's Foundation was established in his memory. To make a donation, simply follow this link. 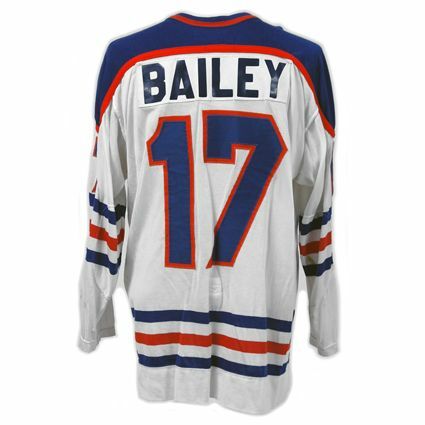 Today's featured jersey is a 1978-79 Edmonton Oilers "Ace" Bailey jersey as worn during Bailey's only WHA season. 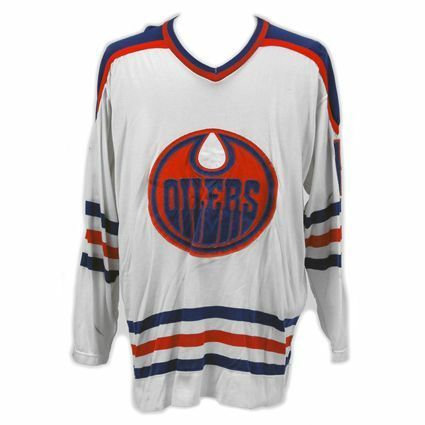 The Oilers adopted this style jersey during their third WHA season of 1974-75 and used this version of the logo with the blue lettering on an orange background through their final WHA season of 1978-79. When the Oilers joined the NHL the following season, the logos on both the home and road jerseys were changed to blue letters on a white background, a higher contrast and much more pleasing combination. Bonus Jersey: Today's bonus jersey is a Koho 2001-02 Los Angeles Kings Glen Murray jersey, which features the "AM" patch in memory of Ace Bailey and Mark Bavis, a fellow scout with the Kings who was also killed on board Flight 175 with Bailey. 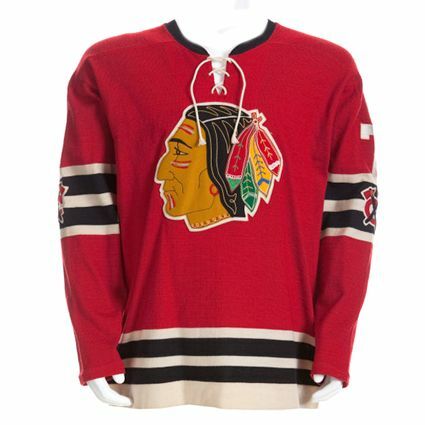 The jersey also is adorned with the 2002 NHL All-Star Game which was hosted by the Kings that season. The Kings introduced this purple jersey as an alternate style to their white home and black road jerseys in 1999 and wore it for three seasons. 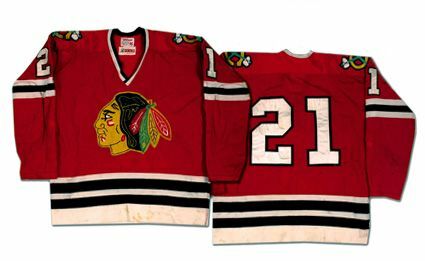 At the time, the all the home jerseys in the NHL were branded as CCM, while the dark and alternate jerseys carried the Koho brand and the practice jerseys were tagged Jofa, as all three brands were part of the same company. 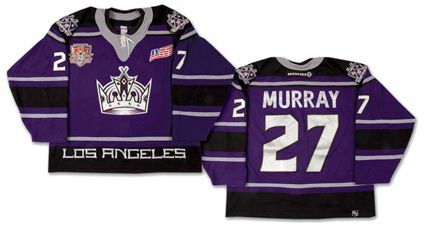 Later, in time for the 2002-03 season, the Kings flipped logos on their jerseys, making the crown logo seen here, the new primary logo for both their white and black jerseys, where it remains in use today, while the purple alternate jersey began to use the coat of arms logo (seen here on the shoulders as a secondary logo) through 2006-07 prior to the purple jersey being discontinued with the change to the new Reebok Edge jerseys, which dictated the temporary elimination of alternate jerseys. Our first video today is a look at the Ace Bailey Got Skills program, created in Bailey's memory. Our second video is from the Ace Bailey Children's Foundation. 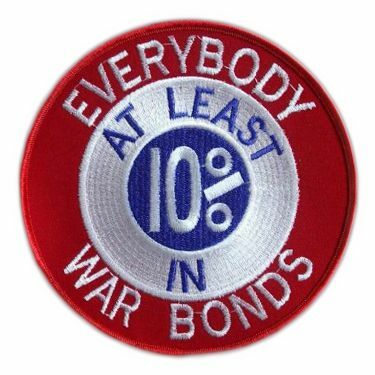 Again, if you'd like to make a donation, simply click on the image below. William Hodgson "Hod" Stuart was born on this date in Ottawa, Ontario in 1879. 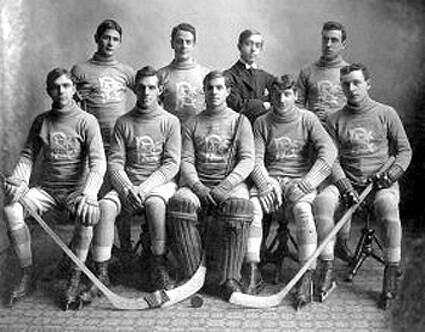 His first senior level team was the Rat Portage Thistles in 1895-96. 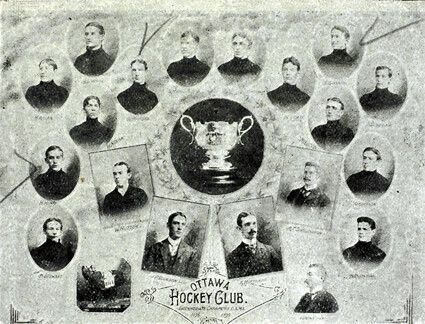 He joined the Ottawa Hockey Club (later known as the Silver Seven and then the Senators) of the Canadian Amateur Hockey League for the 1898-99 season for three games. 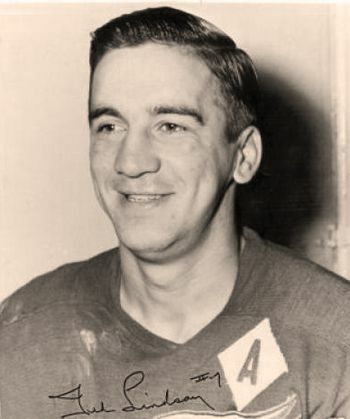 A cover-point (later known as the more familiar term of a defenseman), Stuart played in 3 games, scoring one goal for Ottawa while his brother Bruce Stuart played in one game for the team. 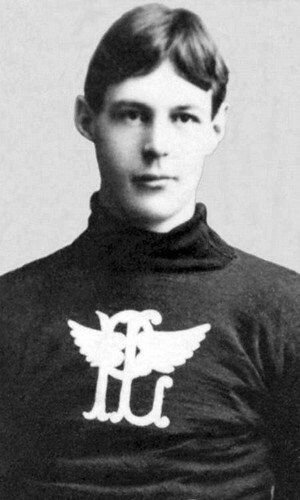 Stuart returned to Ottawa HC for the 1899-00 season and was named the team captain. He played in seven of the team's eight games, scoring 5 goals, as he was not afraid to join the offense from his defensive role. 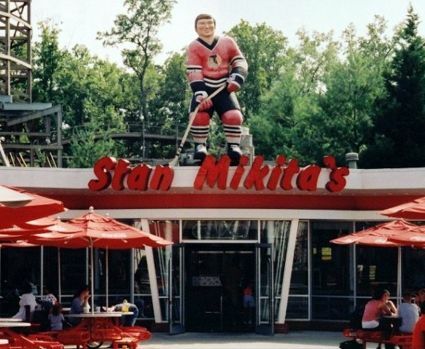 As hockey was still a purely amateur sport in those days, Stuart moved to Quebec when he was able to land a job there though his father's business contacts. The change in location led to him joining the Quebec Bulldogs, also of the CAHL, for the 1900-01 season and his brother Bruce did the same. Again, he played in seven of the club's eight games, scoring twice. 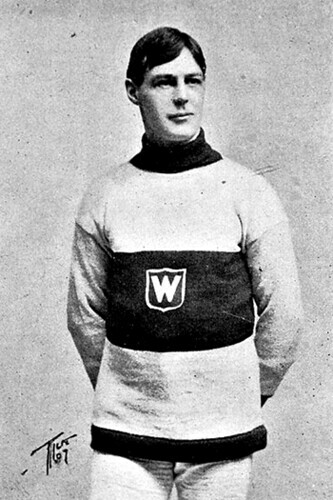 He returned for a second season with the Bulldogs in 1901-02, scoring 5 times in 8 games. As professionalism started to come into the game, Stuart was signed for the princely sum of $15-$20 per week for the 1902-03 season by the Pittsburgh Bankers of the Western Pennsylvania Hockey League in the United States, in addition to his income from his day job in Pittsburgh. In 13 games, Stuart scored 7 goals and 8 assists with 29 penalty minutes as the Bankers finished first in the four team league with a 10-3-1 record. Stuart was named the best cover-point in the league. 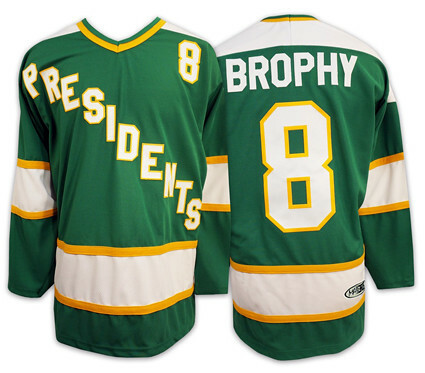 After one season in Pittsburgh, Stuart moved further west with his brother Bruce to join the professional Portage Lakes Hockey Club in Northern Michigan for the 1903-04 season. The club was not part of any league that season and played a schedule of 14 exhibition games, with Stuart scoring 13 goals while Bruce had an astonishing 44! 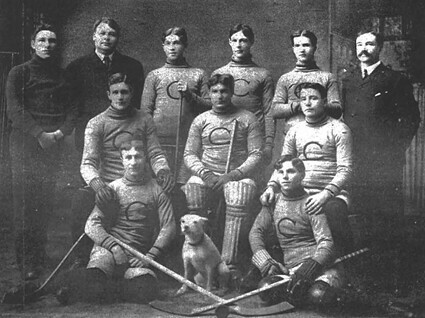 For the 1905-06 season, the American Soo Indians and Canadian Sault were banned from competing in the amateur Ontario Hockey Association after having played against the professionals from Portage Lakes. 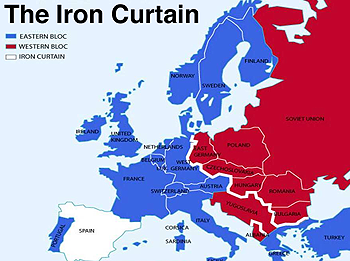 The solution was the formation of a new, professional league, which consisted of five teams, which was dubbed the International Hockey League. Stuart was given $1,800 to play for the Calumet Miners as well as manage their rink for the season. While Hod changed teams, Bruce remained with Portage Lakes for the next three seasons. 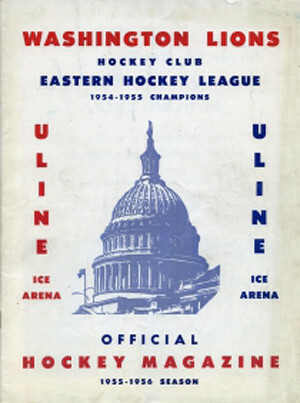 Stuart scored 18 goals in 22 games for the Miners, who won the league championship with a 18-5-1 record, as he was named the best cover-point in the league. On December 11, 1905, Stuart was suspended from the league after other teams complained he had won too many championships and was too rough a player. 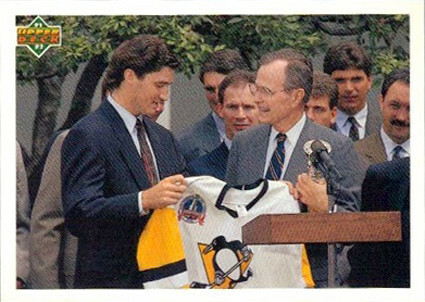 He was reinstated on December 30th and joined the Pittsburgh Professionals for the remainder of their season, scoring 11 times in 20 games. 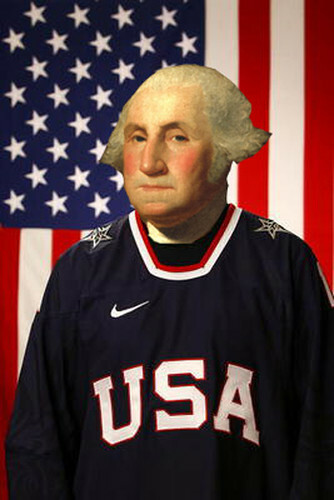 After Pittsburgh completed their schedule, Stuart suited up for one additional game for Calumet. Stuart began the 1906-07 season with Pittsburgh in the IPHL, but after 4 games with a goal and 3 assists, he grew increasingly frustrated with the violence and refereeing in the league and went so far as to have a letter critical of the league and its officiating. 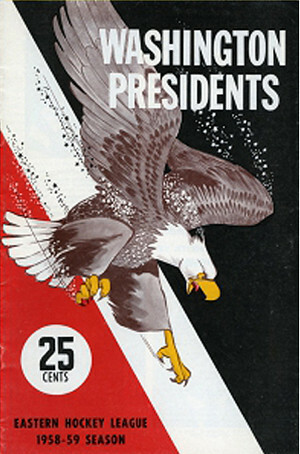 Shortly afterwards, the Pittsburgh players refused to play a game against the Michigan Soo due to the choice of referee. The club's management felt that Stuart was the instigator of the boycott and released him from the club. 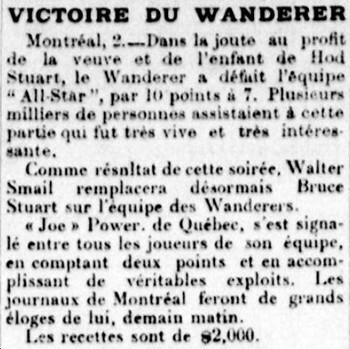 Having heard earlier that the Montreal Wanderers of the Eastern Canada Amateur Hockey Association were not only interested in his services, but willing to make hm the highest paid player in hockey, signed with the Wanderers and made his debut on January 2, 1907 in front of 6,069 fans. He would eventually play in 8 of the Wanderers 10 regular season games, scoring 3 times and was one of only four professionals to play for the club that season. 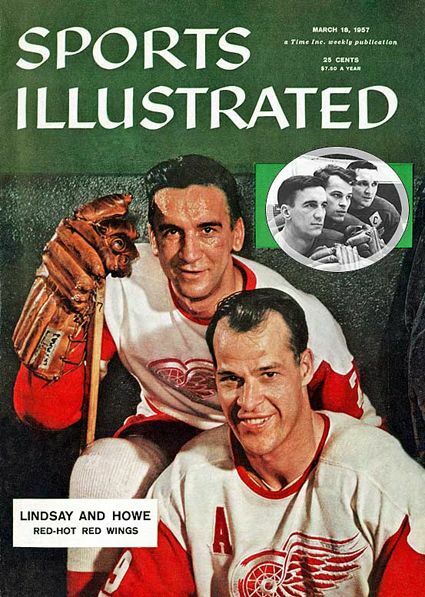 With Montreal, he was once again reunited with Bruce, who also played 3 regular season and 3 Stanley Cup games with the Wanderers that season. 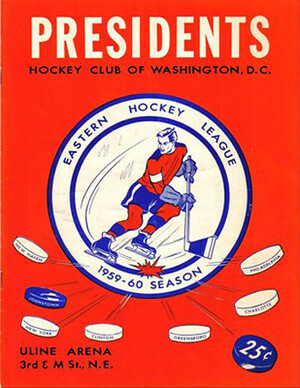 If Stuart was unhappy with the level of violence in the IPHL, he certainly was not pleased with the events of January 12th, when the Ottawa Senators repeatedly battered the Wanderers players with their sticks, with Charles Spittal's attack on Cecil Blanchford later being described at "attempting to split his skull", while the Senators Alf Smith hit Stuart "across the temple, laying him out like a corpse", while Harry Smith broke Ernie Johnson's face, breaking his nose. Reports of the game commended Stuart, stating that he neither flinched or retaliated, even after bearing most of the hits. 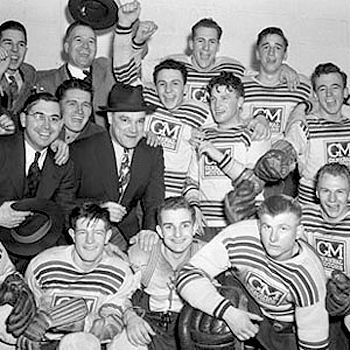 At a special league meeting, the Montreal Victorias proposed suspending Spittal and Alf Smith for the rest of the season, which was voted down and eventually led to the league president Fred McRobie resigning. 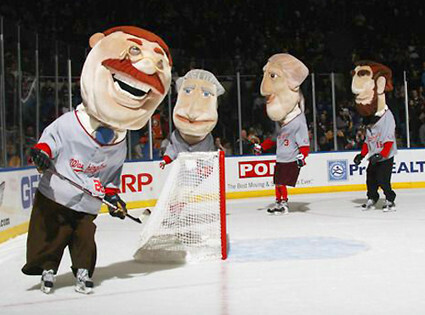 When the Senators returned to Montreal, Spittal, Alf Smith and Harry Smith were all arrested, with Spittal and Alf Smith eventually paying $20 fines. 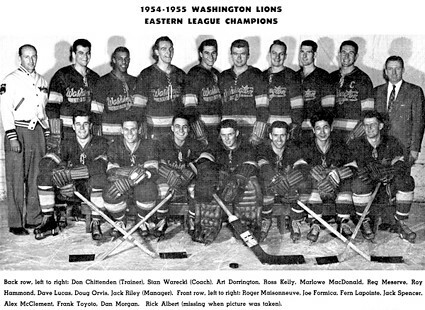 On January 17th and 21st, the Wanderers faced a challenge for the Stanley Cup they had won the previous March. 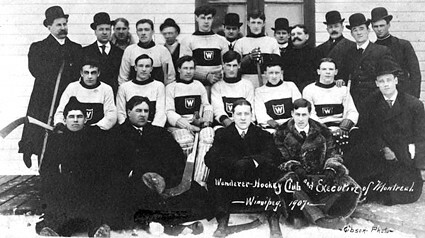 Kenora, the 1906 Manitoba champions, pulled off an upset, wresting the cup away from the Wanderers by winning 4-2 and 8-6. Afterwards, the Wanderers focused on their ECAHA schedule, and racked up win after win, eventually finishing the season as league champions after a perfect 10-0 undefeated season with Stuart contributing 3 goals in eight games. That championship earned them the right to a rematch with Kenora, which took place on March 23rd and 25th in Winnipeg. 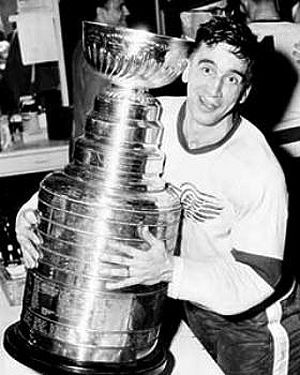 Montreal dominated the first game 7-2, and even though the Thistles won Game 2 by a score of 6-5, the Wanderers large margin of victory in the first game gave them ta 12-8 win in the two game, total goals series, giving Stuart a Stanley Cup championship. 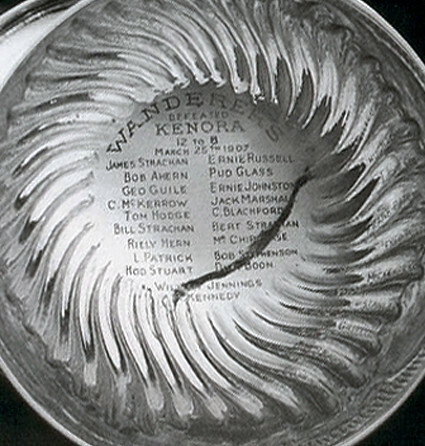 In celebration of their championship, the Wanderers engraved the names of their entire roster inside the bowl of the Stanley Cup, the first winning team to do so in what is now and annual tradition. Tired of the violence in hockey, Stuart quit playing hockey after the Stanley Cup matches and joined his father in the construction business. As part of his duties, he was sent to Belleville, Ontario to oversee a construction project. 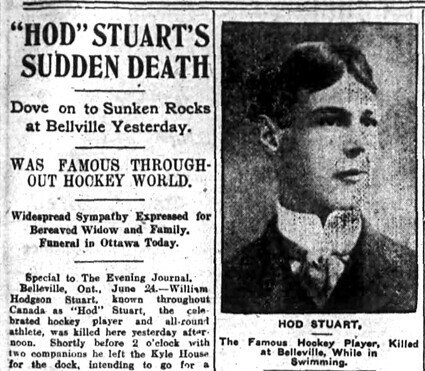 On the afternoon of June 23, 1907, he went swimming with some friends and swam to a nearby lighthouse, climbed on a platform and dove onto some obscured rocks in the shallow water and died instantly of a broken neck at the age of 28 just three months after he and the Wanderers won the Stanley Cup in 1907. 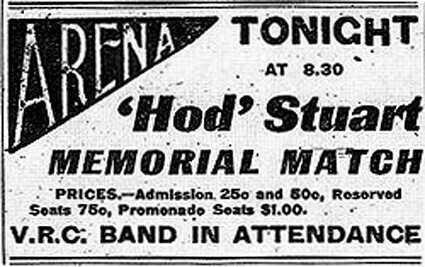 On January 2, 1908 (nine years before the creation of the National Hockey League) an all-star benefit game was held as a benefit for the family of Stuart with the tickets sold out days in advance. 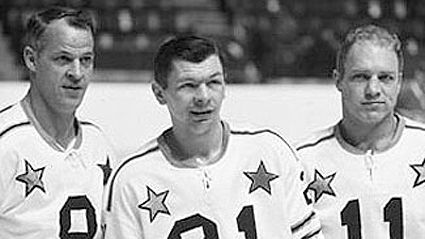 In that first all-star game ever held in any sport, the Montreal Wanderers faced off against a team of players from the Eastern Canada Amateur Hockey Association with the game hosted at no charge by the Westmount Arena in front of 3,800 fans, raising over $2,100 for his widow and two children. 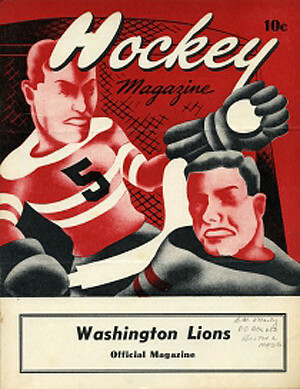 The Wanderers led 7-1 after the first half of the contest, but the All-Stars, which consisted of players from the Ottawa Senators, Montreal Victorias, Montreal Amateur Athletic Association, Montreal Shamrocks and Quebec Bulldogs, fought back to make it a game, but the Wanderers prevailed by a final score of 10-7. 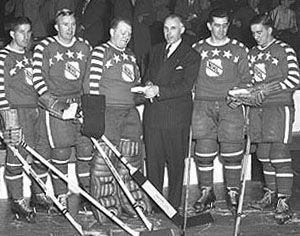 Stuart was inducted into the Hockey Hall of Fame in 1945, one of the original nine honored members of the inaugural class along with Hobey Baker, Charlie Gardiner, Eddie Gerard, Frank McGee, Howie Morenz, Tommy Phillips, Harvey Pulford and Georges Vezina. 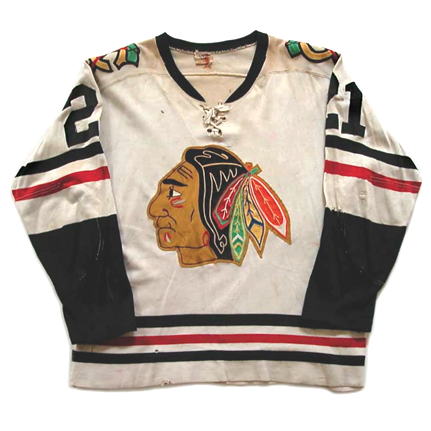 Today's featured jersey is a 1903-04 Portage Lakes Hockey Club Hod Stuart jersey. 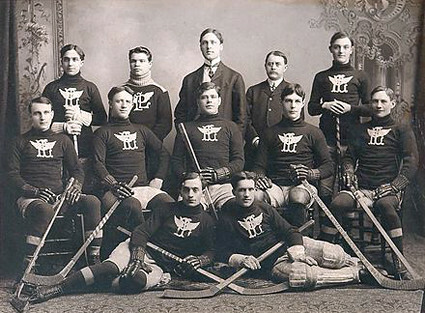 The Portage Lakes Hockey Club was founded back in 1899 and began to pay its players in 1902. 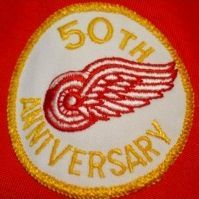 They introduced their winged logo for the 1902-03 season with sweaters that had white shoulders and turtleneck collar. 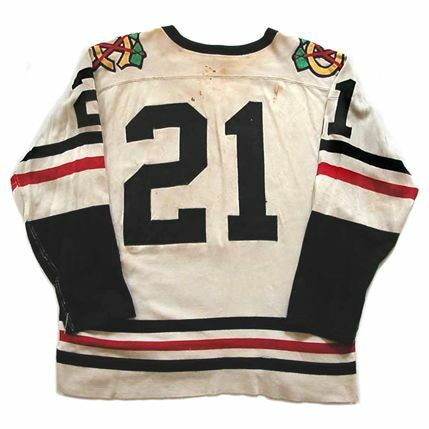 For the following season they sweaters became a solid color and remained so through their final season of 1906-07 when the IPHL folded and the Portage Lakes club along with it. 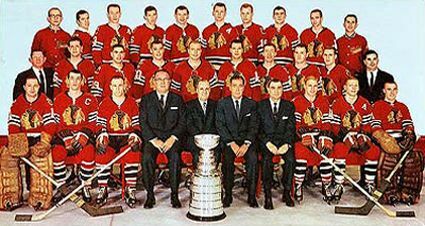 We have seen a single mention that the team's sweaters were green, but cannot be certain of this. 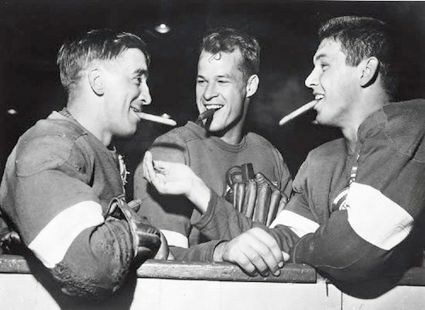 Noteworthy players enticed by the lure of being paid to play hockey who suited up for Portage Lakes at times included Hall of Famers "Bad" Joe Hall, Riley Hern, Bruce Stuart, Hod Stuart and Fred "Cyclone" Taylor.